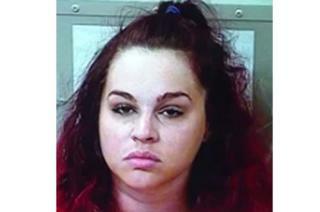 A Tennessee bride has been arrested after police say she pulled a gun from her wedding dress and threatened her new husband just hours after they wed.
Kate Elizabeth Prichard, 25, was still in her bridal gown when she was detained at a motel in Murfreesboro. She allegedly drew the 9mm handgun, put it to her husband's head and pulled the trigger. The gun was not loaded, but she later allegedly loaded it and fired into the air, causing onlookers to flee. Witnesses made statements about events preceeding the police's arrival. They said the couple had been drinking and arguing outside the motel. Murfreesboro police sergeant Kyle Evans said on Monday that both bride and groom were unco-operative with authorities. "She pulled out of her wedding dress a 9mm pistol," Sgt Evans told local media. "Pointed it at her new husband's head and pulled the trigger. "Responding officers let the husband know the honeymoon was over and his new wife was going to jail." Sgt Evans said the bride had tried to hide the weapon in the motel bathroom. Ms Prichard has been charged with aggravated domestic assault, and was taken to jail before being released on a $15,000 (£11,300) bond.